Thorns, prickles, spines and needles provide an effective means of protection for plants against many herbivores which would otherwise find them to be a source of nourishment. A common perception of the Genesis account of creation is that God created plants with no form of natural protection against herbivores because God pronounced that (Gen. 1: 29 and 30 NIV) “I give you every seed-bearing plant on the face of the whole earth and every tree that has fruit with seed in it. They will be yours for food. And to all the beasts of the earth and all the birds in the sky and all the creatures that move along the ground—everything that has the breath of life in it—I give every green plant for food.” But does giving plants for food require that every portion of every plant was edible or that it would require no labor to gain that food source? We could also ask; did plants produce any toxic chemicals in their leaves or bark to make themselves unpalatable before Adam’s sin? Would Adam have found munching on a fern leaf as satisfying and biting into a ripe apple? Would a ripe apple even have been different than an unripe one in Eden since today unripe apples produce chemicals that discourage us from eating them until they ripen? Why would Eve have perceived one fruit as “good to eat” if every part of every plant were given to eat and couldn’t have tasted bad? Previously we saw that young-earth creationists are convinced that thorn bushes and thistle plants had their origins on Adam’s sin (Adam, Eden and the Corruption of Nature: A Thorny Young Earth Assumption). We asked if this made sense in light of a ecology of the original creation and the context of the rest of scriptures. Today I would like to explore the origin of thorns a bit further. 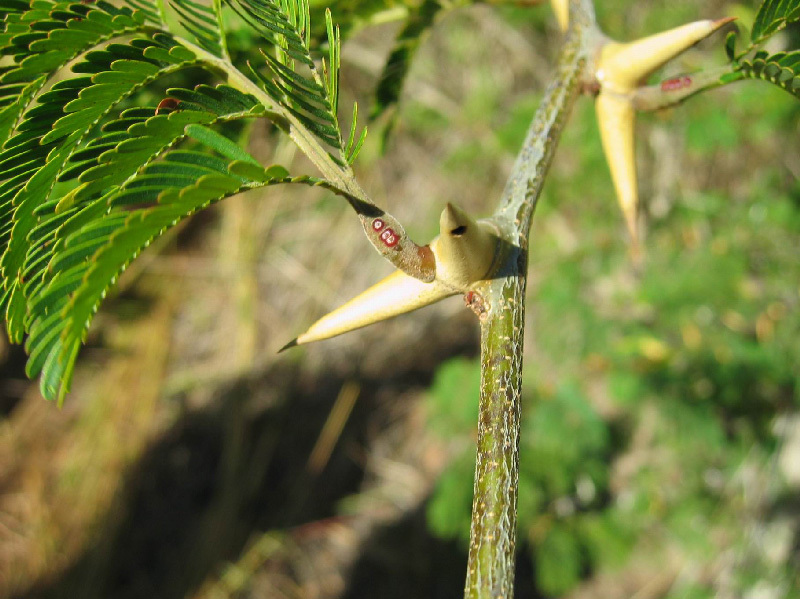 This time we will look at a particular groups of plants that are often associated with their extreme thorns: Acacias. I want to share a brief natural history of acacias with you and then pose the question: what did acacia trees look like in the prelapsarian world (ie. before the fall of Adam? Hundreds of species of acacia have abundant spines which are modified branches. These spines may be thin and long or highly inflated at the base. The latter often are hollow at maturity and ants may live in them. The acacias are species of trees and shrubs of the genus Acacia although that genus has recently been divided into multiple genera. There are over 1300 recognized species and innumerable varieties of acacias. Acacias are members of the much larger bean (or legume) family of plants. All members of this family produce a distinctive type of fruit which is a bean pod called a legume. Acacias are found on all continents except Antarctica but are the most species-rich in Australia. Many acacias live in deserts and other arid regions of the world and are uniquely adapted to life in this harsh environments. 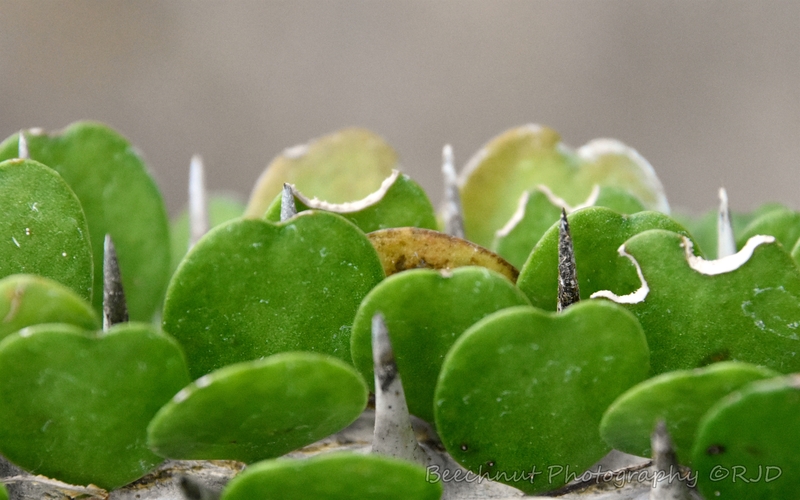 Some of those adaptations include the ability to fix nitrogen and protective thorns. First, like other members of the bean family, many acacias are capable of performing nitrogen fixation via the bacteria that are housed symbiotically in their roots. These bacteria contain the biochemical machinery to take atmospheric nitrogen (N2) and convert it to a form that can be used by plants. This ability permits bean plants to grow in what would otherwise be soils that could not support them due to nitrogen deficiency such as those found in the desert. Secondly, many acacias produce precocious numbers of thorns. Interestingly, although highly specious in Australia, most species in the deserts of Australia do not have thorns while those in the deserts of African and the Middle east are extremely thorny to the point of being given names such as devil thickets or devil trees. However, acacias that don’t produce thorns often compensate by having far higher levels of toxic chemicals in their leaves. How are these characteristics of acacias adaptations to their environment? Thorns in desert acacias are quite clearly an adaptation of the plant that prevents the tender leaves from being eaten by herbivores. Thorns are non-photosynthetic tissues and thus cost energy to produce rather that producing energy like the leaves do. But it is worth the expense to the plant as a whole because the leaves are so important the survival of the plant. You can see from the picture above that the thorns produced are often longer than the leaves themselves which is a very effective way of warding off large mouths from taking a bite on the plants. This is especially important for desert plants that can ill-afford to lose the few leaves they produce. However, it seems for every protective adaptation of one organisms there is another organism that has found a way around to thwart those defenses. In this case, giraffes have 20-inch-long tongues which are really tough. The bottom lip is also incredibly tough and can withstand the poking of these thorns without much problem. Even the inside of the giraffes mouth is adapted to eating what would be inedible food for you and I. 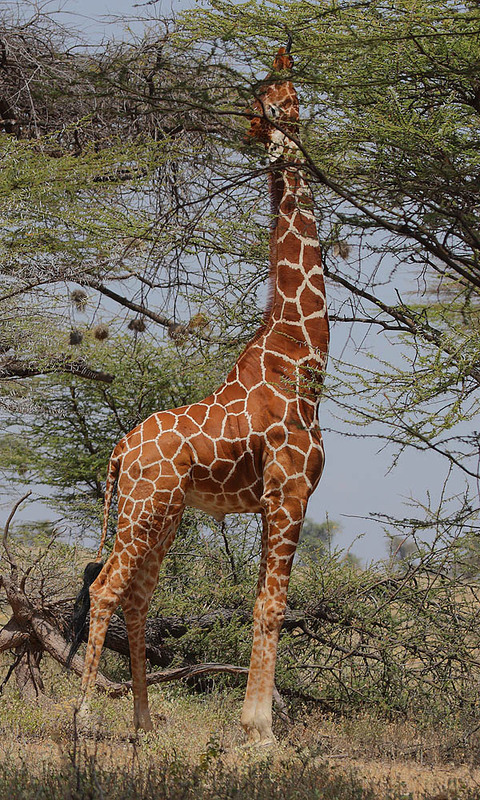 So, giraffes can not only reach high into an acacia tree but have all the physical traits needed to take advantage of acacia tree as a food source. In Australia there are not many native large herbivores other than marsupials most of which can not reach into trees. Australian acacias still need protection from caterpillars and other insects which are very common there and so they are more likely to produce high amounts of toxins in their leaves. So the lack of thorns makes sense without evoking any relationship of the thorns to man. Some acacias in central America produce swollen thorns that are hollowed out by ants for homes. There are multiple species of acacias that have this ability and each one has its own species of ant that lives in its thorns. These acacia thorns not only provide a home, they also provide the food for the ants which live exclusively on these trees. That food can be in one or both of two food forms. Beltian bodies are small protein/lipid rich structures which the leaflets will produce at their tips which the ants can clip off and carry back to their homes in the thorns. Some acacias also produce what are called extra-floral nectarines (see picture). These are little bumps on the petioles of the leaf that ooze sap that the ants can drink. So the ants seem to be well taken care of by the trees. What does the tree get in return for all these favors? Well, the ants are ferocious defenders of these trees. 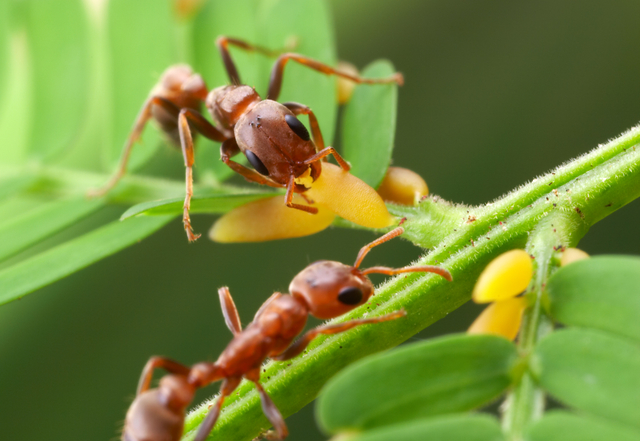 If any insect or animal lands on the tree one ant will give off a pheromone signal to the other ants and they will attack the invader and kill them or drive them away. For at least one species of acacia, the ants even go as far as chopping down all vegetation around the acacia tree to reduce competition with other plants. Prelapsarian pre-adaptations to the Fall? Given this short background on the amazing adaptations of acacias to their environment lets ask the question: which of these adaptations is not a “good” feature of the plant? Creation scientists tell us that any evidence of features that would be used for competition or adaptation to a world in which death and decay is present must be features which where not present or at least served either no purpose or very different purpose in the original creation (the prelapsarian world). So how, according to creation scientists, do such intricate features that seem so well designed for this fallen (lapsarian) world come about? The creation science explanation is probably best summed up in this paragraph from an article talking about a complex interaction wherein certain wasps are able to attack and anesthetized tarantulas and then use them as hosts for her larva. The mother wasp is genetically and behaviorally programmed to locate and anesthetize a tarantula, and to carefully transfer her larval offspring to the arachnid’s body. Why does all of this work out the way it does in each life cycle of this particular kind of wasp? Because, before Adam’s fall in Eden, God cleverly and carefully planned out (consistent with His infinite foreknowledge) the innumerable details that would be needed, after Eden, to make this air-to-ground system operate successfully enough to propagate tarantula hawk wasp populations from one generation to the next. (From James Johnson, “Slow death for a tarantula: a lesson in arachnid apologetics”, http://www.icr.org/article/6390/). In this case, the wasp in the Garden (and presumably outside Eden but see my post: Adam, Eden and the Corruption of Nature: A Thorny Young-Earth Assumption), would not have attacked and killed the Taratula and would have somehow found a way to make more wasps (more of their own kind) via some non-destructive pathway. However, for Johnson, this ability of wasps to find and use Tarantulas as hosts for their young is so intricate he believes it could only have been created this way so he proposes that God pre-programmed these wasps so that natural selection put into motion by Adam’s sin would put into motion a series of changes that God knew would happen to give these wasps this new way of propagating themselves. Was the old way just not good enough? Why did Adam’s sin require that wasps be reprogrammed but could not have been reprogrammed by recreation? What is “natural selection” in this lapsarian world if this mechanism of change had no function in the prelapsarian world. These are difficult questions that, although they sound confident, even creation scientists get nervous talking about. 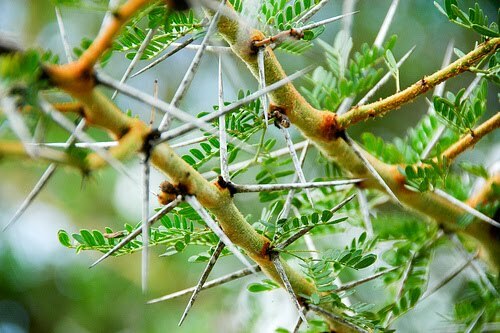 Returning to the acacias: creation scientists insist that thorns are “bad” and could have no part of a “good” creation. Rather they the result of Adam’s sin. But how do they define “good.” It appears good is not defined scriptural but by their feeling about what makes something good. In Genesis one “good” is a reference to the purpose of things not the physical object itself. What God has made is “good” because it is good for man the world is made for. It may be helpful to look at what was not “good” in the creation account. It was not good that Adam should be alone; it was not good that the world should be in a state of chaos and disorder and so God ordered it for man. He did not declare the results of His creative acts of Day 2 good, possibly because the result of those acts – the separation of the waters above and below – did not yet yield anything good for man such as the land on which he would live which was formed on Day 3. What about thornbushes and thistles? Are they “good?” They aren’t “good” for man and so would not be labeled as “good” but they also aren’t evil. They are part of the disordered creation that Adam, as God’s image-bearer on Earth, was supposed to have tamed. God formed man from the dust of the ground and placed him into his presence in the Garden. There he was given instructions including the command to guard and protect the garden from the evil one. If he obeyed the scriptures paint a picture of an expanding Garden (See: The Garden Temple: A Framework for a Biblical Worldview). Adam would have brought the rest of the creation under his submission as a steward of God’s creation. That creation included thorns and thistles that were part of the original world in which man was created. Remember that God as part of his curse said that the “ground would bring forth” thorns and thistles. This is the same place that Adam originally came from. Adam was expelled from the Garden into the – as yet – untamed world. This world was not like the Garden where the fruits of the plants there were easily obtained. This world he was cast into was a wilderness not a paradise. Man would have to work by the sweat of his brow in this land that was not blessed by God’s immediate presence. Instead of easy fruit to pick, he would have to plant crops. An imperfect relationship to God and to his fellow-man would mean that instead of bring the ground into submission – working together in harmony to tend the field and protect it from the encroaching weeds – his crops would be sown with thornbushes and thistles and his relationships would suffer the same impediments. I hope my brief comments here and fleshed out a bit more my other article (Adam, Eden and the Corruption of Nature: A Thorny Young-Earth Assumption) provide a more faithful interpretation of the whole of scriptures with respect to the conditions and purpose of God’s creation. There are so many questions that this short post raises that we may be able to explore in the future. For example, if giraffes did not need long necks to reach food and they did not need resistant mouths for spines did they not have long necks, very long tongues and exceedingly tough skin in their mouths in the prelasparian world? If some ant species only live on acacias where did they live when acacias had no spines? If acacias have hundreds of genes that code for highly specialized features that allow them to survive in extreme deserts what purpose did these genes and features serve in the idyllic “good creation” as envisioned by young-earth literalists. In fact, most young-earth creationists don’t believe the harsh environments we call deserts existed prior to the Flood much less before Adam’s sin. Instead they view the entire world as a perfect paradise. Once again, the young-Earth creationists not only get the science wrong, they get the Bible wrong. Genesis is pretty clear that Eden was a specific place rather than being the entire Earth, and that the world outside of the Garden was wild (and thorny) place in need of subduing. Joshua, the problem for YECs is that even if they could explain all adaptations in terms of pre-programmed genetic switches (and that is a tall order) there is still massive amounts of evidence from geology, paleontology, that live evolved over many millions of years. Moreover, with the severe genetic bottle-necks at the time of the Flood, the necessary alleles (variations of genes) would be too decimated to produce even slow evolution, let alone dramatic, breakneck speed changes YECs claim occurred, to produce thousands of new species in a few generations. Tyler Francke at godofevolution.com has a nice couple of articles on why saying that animal death is a consequence of Adam’s sin doesn’t make sense from a Biblical perspective. On one hand, Paul writes that all those who die in Adam can live in Christ, and it’s pretty obvious that animals can’t get saved; on the other, if all animal death were a consequence of Adam’s sin, you would expect the writers of the Bible to reflect on that a bit and mourn it, but instead, they declare it just another part of creation to praise God for. I think that young-earth creationism can work quite well without the idea that animal death, plant thorniness, and inclement weather are all consequences of the Fall, and Ken Ham and his ilk would do very well to acknowledge that and drop it from their arguments.